It is now 20:30 local time and I finally get a chance to write a first update. 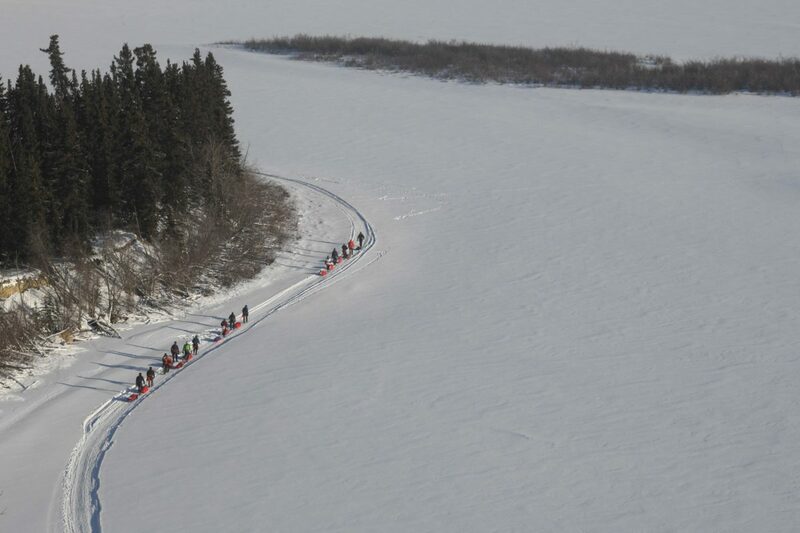 Day 1 of the Montane Yukon Arctic Ultra was an interesting one. We got started on time at 10:30 at Shipyard’s Park in Whitehorse. It was about – 38° Celsius. Which meant a few athletes decided to skip the group photo at the start. More than understandable at these temps. Due to the temperatures there has been a real danger of frostbite and hypothermia. So, it was great to see that both at Takhini Bridge and at the marathon finish at Muktuk no athletes had problems with either. Layer management was one of the main challenges and most participants did really well. Those who did sweat had to take a bit more time but managed themselves well and simply put on dry spare layers. At Takhini Bridge local marathoner Amanda Lieverse had to scratch. Two more athletes called it a day at the marathon finish. Those were Darrah Miskell who had issues with Bronchitis and Palle Andersen who simply was not feeling well. Darrah is back in Whitehorse and Palle is sleeping at Muktuk. We had a few challenges today, like a generator that did not want to start and some equipment that was late for Dog Grave Lake checkpoint. Nothing we could not deal with but it meant our final preparations at Muktuk were a bit delayed. This led to three marathoners having been misdirected. Normally marathoners run past Muktuk for some kilometres, then turn around and take the turn-off to come to Muktuk. That way they get the marathon distance. It was not their fault and they all went out again to get in the full distance. Needless to say that this was frustrating for them. But it speaks for them that they did it anyway. I apologised and will now have to check a few things before I can do the final marathon ranking. All other marathoners had no problems and they were all smiles. The mood amongst the ultra athletes was great, too. It usually is on the first day. It was cold but the sun was out. Energy levels are high and even though it was cold, they have not suffered too much, yet. Luckily the weather forecast was right. It is now cloudy and it has “warmed up”. Tonight it should be around – 35° Celsius. The crew at Dog Grave Lake checkpoint is ready. Diane, Julie and Ellie are already based in Braeburn. Jo at Scuttlebutt is resting while I am on headquarter shift. Sarah and Trish are at the “exit point” at the Dawson Overland Trail parking lot with their Fraserway RV. That is an area that is very cold and often athletes run into problems there during the first night. Now they can knock on a door and have a warm place if they decide to scratch. With them are Jeff Boyd and his friend, who also happens to be a Jeff. They are there to do any early morning missions on ski-doo if need be. All other crew members are soon getting a well deserved rest before we start into day 2. I should be able to update the results table with In/Out times tomorrow. Right now you can use the Trackleaders page to see where everyone is at. We also are aware that a couple of SPOTs are not working the way they should. One is that of Enrico Ghidoni. He arrived at Muktuk at 15:37, was feeling good and left shortly after. Most other SPOT issues we have been able to fix. Just Matt Hosford’s inReach is not sending but he is with David Brabec who is showing on the map. Tomorrow I will also have photos and and later tonight I will share Yann and Thilo’s video of the days leading up to the start. If you want to see photos and videos already now please check out our facebook group.